CPR & First Aid Certification Overview: Learn CPR for Adults, Children, and Infants, how to use an Automated External Defibrillator (AED), and how to apply standard techniques for First Aid. After successfully passing our Free CPR and First Aid Test and after a successful purchase you will receive your certification and PDF card instantly, via email and on-site. You'll also receive your Hard Card within 2-5 business days. All courses follow the American Heart Association (AHA) and Emergency Cardiovascular Care (ECC) guidelines. First-response situations often call for both quick thinking and instantaneous mastery of CPR & First Aid, and the skills associated with them. You never know when an emergency situation may strike, and so the only defence is proper preparation. This is what makes CPR & First Aid Certification so important and in such high demand. We understand the importance of quality CPR & First Aid class and training options. However what makes us unique from other CPR & First Aid certification providers is that we also take your budget and schedule into account. Have you been searching for a quality training program that meets your day to day needs? Do you have a limited time frame or budget, but still need access to a quality program for your job? We may be exactly what you are looking for. You can find everything you need to know to get started listed below. Or, if you have additional questions about how to begin with your CPR & First Aid certification, get in touch with our support team for on-demand answers around the clock. With doctors and other qualified professionals available, why is it important for everyday people to learn about CPR & First Aid? The truth is that, while a high-level medical professional is always the best recourse for a patient in need, it is often the first responders who are able to keep them in stable condition until help arrives. CPR & First Aid training allows average people to respond to a wide assortment of common, everyday conditions making them an invaluable resource for on-the-spot emergencies. After a quick survey of the material covered by our class modules, you may be surprised at the number of topics we cover. 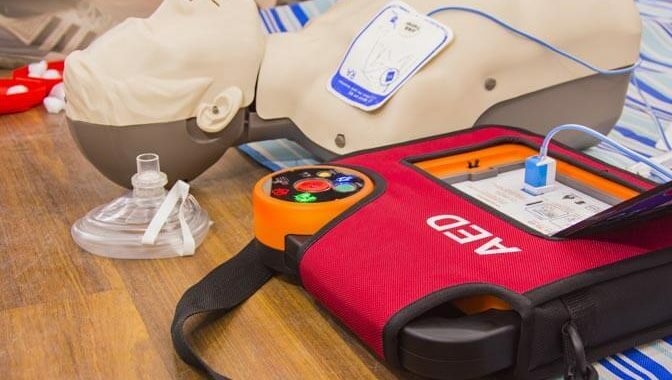 We offer our CPR/AED/First Aid certification class as an option for those who want to expand their knowledge beyond the standard CPR or First Aid training classes. The CPR & First Aid certification program covers all of the necessary information and can be completed in as little as 25 minutes. While it may seem like a lot of information to cover in a short amount of time, the step-by-step instruction and helpful illustrations make the entire process a breeze. The entire program is made to accommodate the needs of businesses, organizations, and other groups who are seeking an inexpensive way to certify all of their members. The full CPR & First Aid cost comes down to a mere $18.95 $14.95, easily outstripping most of the other certification providers while still delivering industry leading certification. Large groups benefit doubly, with our group discount option that can shave off 20% or more from groups larger than five members. Get in touch with us today to learn more about how to make your CPR & First Aid cost as low as possible. Our CPR & First Aid class and training modules are designed to go as in-depth as possible while still keeping the class load down to a minimal time commitment. See a brief overview of all of the modules listed below, or look into the class itself for a first-hand view of everything it has to offer. Once you have thoroughly reviewed all of the thirteen class modules in our CPR & First Aid certification program, you will be ready to complete the test. For those feeling nervous beforehand, don’t worry, as the final CPR & First Aid test was written with you in mind. A total of ten questions are presented, seven of which must be answered correctly to receive certification. If you fail the test, no problem, as you can retry as many times as necessary before purchasing your certification. CPR & First Aid recertification is important because it allows you to brush up on your skills on a regular basis, to stay in peak form for all of your patients. Of course, retaking your CPR & First Aid test every two years can be a nuisance, which is why we have made the effort to reduce the hassle and bring down your recertification process to mere minutes. Each of our available classes offer the option of skipping straight to the final test portion. While this is not recommended for first-timers, those seeking CPR & First Aid recertification can benefit from the streamlined process and complete the entire process in a fraction of the time it would otherwise take. If you need a quick refresher before sinking your teeth into the test, feel free to look over any of the modules, organized clearly for your benefit. The top priority for businesses seeking certification is ensuring the highest level of CPR & First Aid validity. Whether it is the requirements of OSHA, the AHA, or both you are looking to satisfy, our classes will fit your need. All of our classes exceed the recommendation guidelines. Beyond the official certification requirements, OSHA and AHA approval is a testament to the quality of our CPR & First Aid certification classes. Every person that walks away from our programs can have full confidence that their medical knowledge is on par with anyone who has taken a CPR or First Aid class through the most esteemed providers. If you are looking to expand your knowledge even further, take a look at one of our other classes which provide the same level of quality on the health and safety procedure of your choice. Earn Your CPR & First Aid Certification Today!